The world has spoken! Greyhounds are the best dog ever. For six weeks you’ve taken mine and Dave’s word for it. Greyhounds are the best! we bark. Adopt a tall, skinny pup! we plea. Your life will be changed forever and ever amen! we shriek while roaching on the couch. But there’s a limit to how persuasive one gal and her silky black hound can be (mmm, so silky). Thus, we decided to collect stories from around the globe to back us up. Stories of love, lives improved, sweet moments between hound and human - to make your eyes spontaneously fill with water and overflow. Dave asked the internet: Hey! 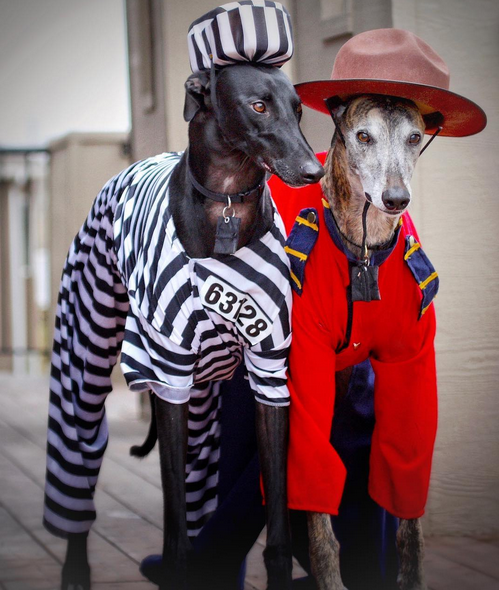 Tell us why you LOVE greyhounds! and adoring owners from around the world answered with alacrity. Today, we’re bringing these heartfelt international stories to you. Read these 10 loved-up stories that prove people in every corner of the planet go ga ga for greyhounds. It’s a pup pandemic. It’s all the persuasion you need to foster or adopt your own! Meet you at the end. "This might seem like an ordinary photo of two people and a greyhound doggo, but it’s so much more. Story time! One miserable Wednesday morning, Alex and I were walking through the city when we saw a dog and his owner up ahead waiting to cross the road. Being the doggo lovers we are, we didn't want to pass up an opportunity to give this one a pat. We picked up the pace and quickly caught up. Catie could tell straightaway that we were dying to pat her greyhound so she immediately introduced us to Dave... and our day changed for the better! “My son has depression and anxiety since being bullied in his teens. He lives a solitary life and doesn’t socialise much. 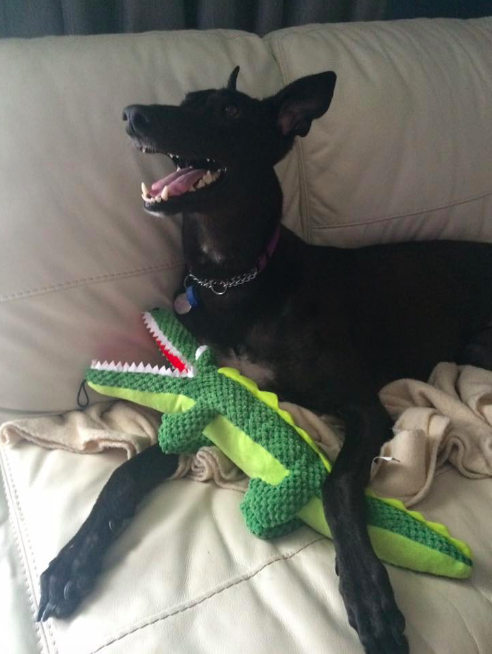 After adopting two greyhounds myself and realising what wonderful companions they make and the unique healing ability they seem to have, I persuaded him to adopt his own. She has changed his life and he now has someone to care for and nurture. When he takes her out, he’s stopped by strangers who want to talk about her and he proudly shows her off. He volunteered recently to bring her to the animal expo and talk about her to anyone that stopped to listen - something he would never dream of doing previously. It fills my heart with hope and joy when I see this. Sadly she has kidney failure and is here in this world for a short time only, so we treasure every day we have with her. 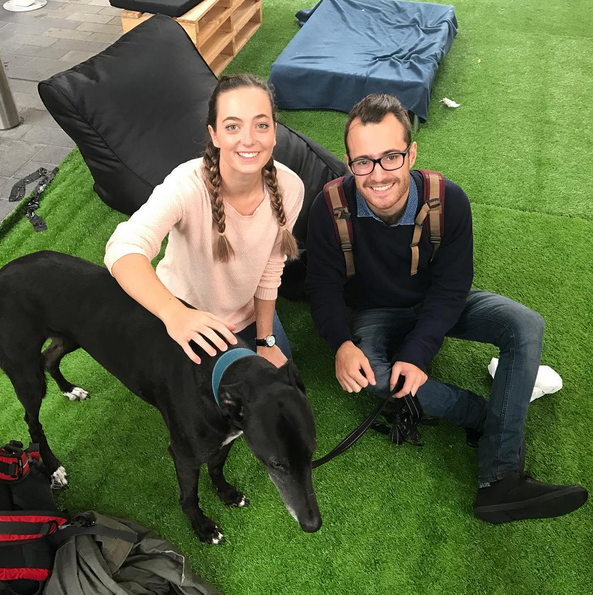 “My wife Bek and I entered the greyhound world via the foster option with the Greyhound Adoption Program SA. And it was the most pathetic foster effort of all time! We fell in love from across the carpark. We had decided we would keep her forever well before the 45 minute car ride home was over. She was so gentle and just wanted to cuddle. And even for a greyhound her economy of effort is awesome. But underneath her sweet exterior she has a fearsome passive aggression, often getting up on to Bek's favourite spot on the couch when she knows Bek is coming to sit down. 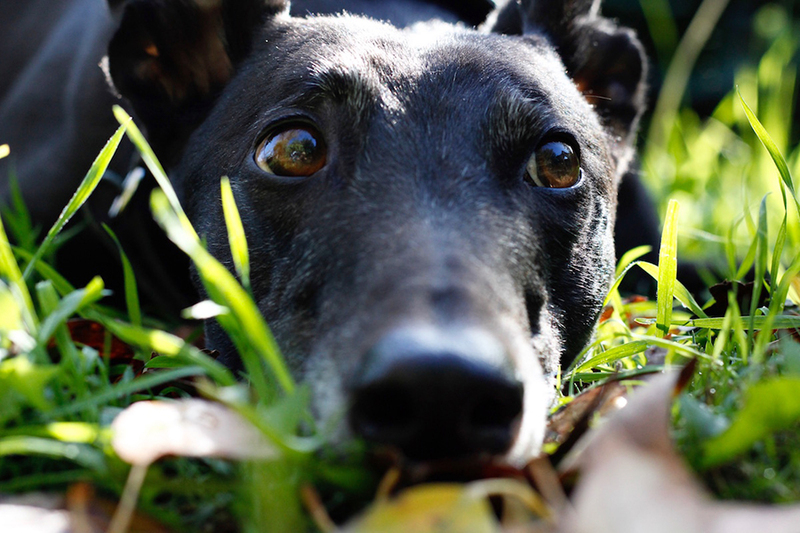 “When I was looking for a dog, I came upon Irish greyhounds looking for a home and a whole new world opened up to me. 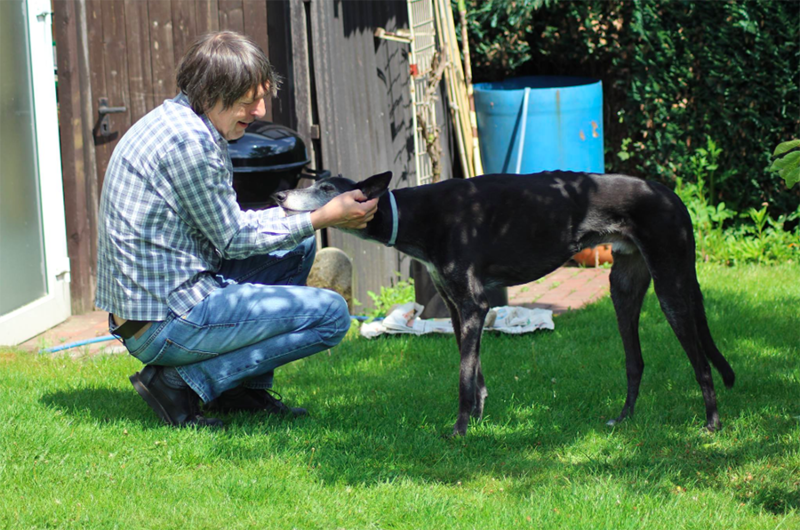 Soon after, a greyhound named Colin came to live with me. He’ll be 13 in July and was the one who infected me with the greyhound virus! Two more hounds now share their lives with us - Andy and Paddy. “When we got Indi she was very timid. In the five months since we have had her she has turned into a happy vibrant dog who loves to play (especially with squeaky toys!) and snuggle. She comes everywhere with us and is such a part of our family. “At a local pet expo, some new fosters were brought in to woo the crowds and one particular brindle boy named Nemo was extremely shy. He felt most comfortable in the open crate in the back of our booth. No amount of coaxing or assurance was helping this poor fellow. A mom and her daughters stopped to pet the hounds and the eldest of the two, maybe 8 or 9 years old, made her way over to Nemo. She got on the floor and just laid next to the cage, watching him. Before we knew it, she had made her way into the crate with him. I almost panicked since I really didn't know this grey or how he would react to such an invasion of space! However, Nemo appeared much more relaxed. She was gently stroking him and very quietly holding a conversation with him. After about an hour, she came out of the crate and he followed! We let her hold his lead. She continued to stroke him and soon, Nemo was at the front of the booth with everyone else, allowing people to pet him. He was still shy but not fearful. “My boy Cody came to us in 2012 at the age of 3. He was skinny and shy, but loved us from the minute he came into our lives. We got his diet straightened out, had his coat shining and took him to obedience training. He turned into the most loving greyhound ever! He liked having his paw held. He liked to sleep on the bed with me. He LOVED laying in the sun no matter what the temperature. He was just a pure joy to have in our lives. Then in 2015 he was diagnosed with intestinal Lymphoma and we had to help him to heaven. He was my soul. He gave me his heart and he took mine with him when he went. 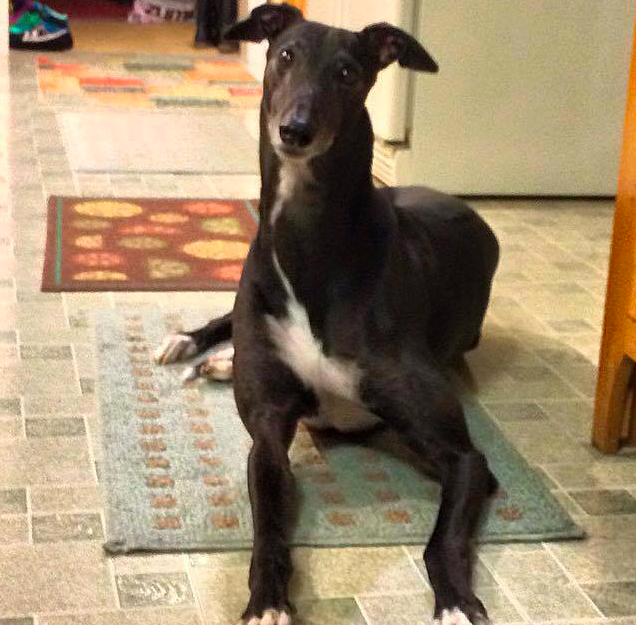 “I had wanted to adopt a greyhound for over 10 years but my parents wouldn’t allow it. I’m glad now because I wouldn’t have found my Luka, my very first greyhound. He was the love of my life. My heart hound. He made my heart sing every day. 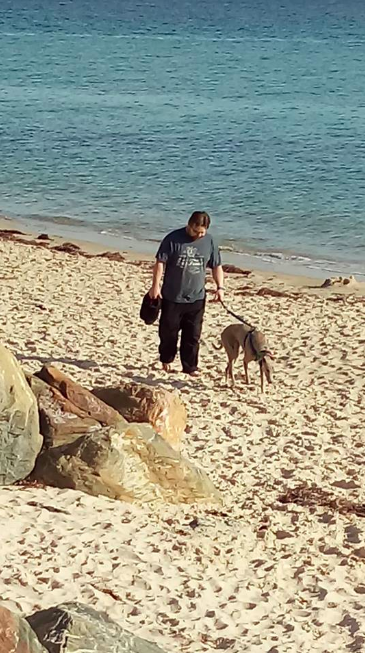 Because of Luka I made amazing friends, traveled to places I never would have had the courage to go to and met amazing people who dedicate their lives to rehoming greyhounds. Luka and I worked at over 300 adoption events. 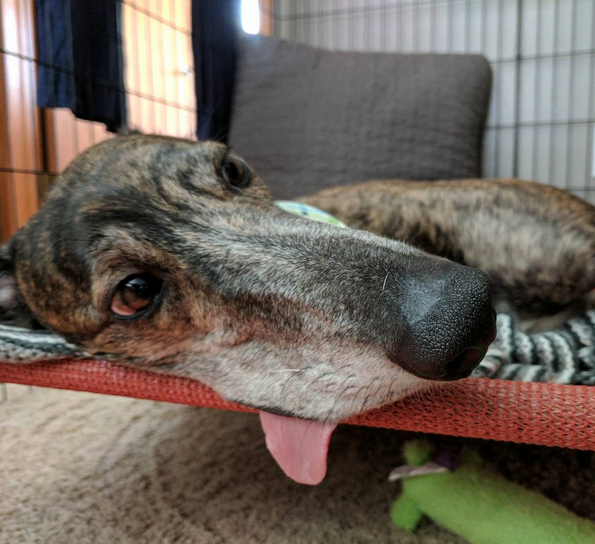 I want to share the joy and love that having a greyhound brings to a home. “Hello our cute Australian friends! It’s a pleasure to share my feelings, thoughts and experiences with this beautiful breed! I could not imagine my life without a greyhound. I hold a very special place in my heart for these lanky creatures. I’ve had four greyhounds and each of these gentle giants has brought a ray of sunshine into my life in their own unique way. They are playful, loyal, compassionate and comical. See! It’s not just us - there’s an army of raving grey fans out there (and they’re currently taking applications). If you’d like to enlist, it’s as easy as giving GAP SA a tinkle to ask about becoming a foster carer. Before you know it, you’ll be sharing the story of how you met your soulmate with anyone who’ll listen on the internet. And that, modern dog lovers, is what life’s all about.